One night in 1859 in the pope's kingdom his police raided a Jewish home. 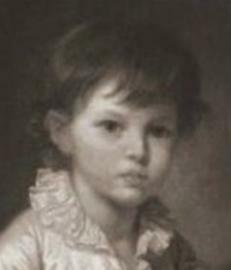 In accordance with one of the “sacred canons” and at the pope's behest, they kidnapped the family's six-year-old. Almost a century later, at the end of WWII, in accordance with the same Church law, the Vatican refused to return baptised Jewish children to surviving relatives. Canon law still gives the final say to the bishop, not the parents, and to its own rules, not civil law. Until 1871 the pope was head of both church and state in his kingdom in central Italy. Known as the Papal States, this society was run by the Vatican on its own territory and its own terms: that is to say, according to the “sacred canons”. Several decades later these canons were organised into a code of Canon Law and a revised version of this remains in force today in both the Vatican City State and in Catholic institutionsaround the world. This 1868 Remington Rifle is a model known as the Pontificio. It was used by the Pope’s army when he refused to negotiate the surrender of his kingdom. Even after this needless bloodshed, Pius IX maintained that he was still the King of Rome. He never accepted that his subjects could question Church rule on their own. In his encyclical Etsi multa, §28, he blamed outside forces, “the Synagogue of Satan”, for perverting their minds. Pius IX claimed that the Church was a “perfect society”  and this is echoed in several concordats. “The Spanish State recognises in the Catholic Church the character of the perfect society...” So begins Article 2 of the Franco concordat. And in Article 3.1 of the Trujillo concordat the Dominican Republic also acknowledges the Church as a “perfect society”. In fact, even more than a decade after they were freed of the pope’s rule, the anger of his former subjects was such that a large group of them tried to toss his coffin into the Tiber. Contemporary descriptions show the reasons for their dissatisfaction at being forced to live in this “perfect society”. …An utter chaos of feudal and monkish laws…. For Rome alone fourteen special tribunals. In these tribunals, no guarantee of any kind about the proceedings. The deliberations are secret, oral defence is forbidden. Ecclesiastical judges pass judgement on secular matters and on laymen…. The Jews penned [into the ghetto] and locked up every evening, as in the fifteenth century … the clergy mixed up in everything. Priests report to the police. Treasury officials — and this is their own ruling — do not consider it their duty to be accountable to the Treasury, but ‘only to God Himself’. 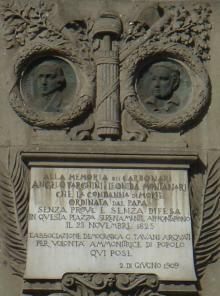 Victor Hugo's account is backed up by a memorial in Rome's Piazza del Popolo to two Carbonari, who were beheaded in 1825 by order of the pope. (The Carbonari was a secret society which aimed to establish democracy, a dangerous position to take in the Papal States.) These two men were executed “without proof and without defence”. How little had changed in the papal states since mediaeval times is also shown by the continued existence of the last remaining Jewish ghetto in the world. 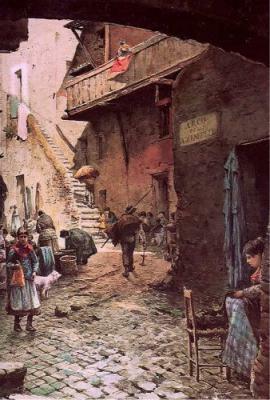 (This was depicted about 1880 by Ettore Roesler Franz.) Some 30 year earlier a petition was submitted to the pope by Baron Solomon Rothschild on behalf of the Jews living in the Roman ghetto, listing in great detail the hardships facing them. This was how the popes treated their most vulnerable subjects — those living outside the fold of the Church in a theocratic state. On a summer night in 1858 there was a knock at the door of a Jewish family in Bologne. It was the papal police, and their visit was mandated by the “Sacred Canons”. They came to forcibly remove a six-year-old child from his loving family — forever. The requirement that Jews in the Pope’s domain live within the ghetto was only abolished when the last remnant of the Papal State was overthrown on September 20, 1870. The ghetto of Rome was the last remaining ghetto in Western Europe until its later reintroduction by Nazi Germany. This is still the position, even of the revised 1983 Code of Canon Law. In 1870 Italian forces breached the walls of Rome and ended papal rule, freeing the inhabitants to live under modern civil law. Since then the temporal control of the Church has been confined to the Vatican City, a city-state within Rome of less than half a square kilometre, where Italian law has no jurisdiction. Canon law has free rein in the Vatican City, whose 500 citizens are all adults and all clerics. Few would quarrel with this, as it is their choice to live under Canon Law. 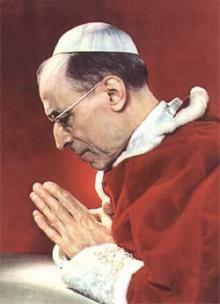 However, canon law also reigns — as specified in numerous concordats — in Church institutions worldwide. The problem with this is that this puts under canon law laymen who have not entered Catholic religious orders and therefore have not agreed to live under this regime. Today this can affect laymen who work in a Church institution and who can be fired for an infraction of canon law, such as remarrying after a civil divorce. However, during the Nazi era large numbers of laymen, and non-Catholics, at that, found themselves under canon law, not because they wanted a job, but because desperate parents wanted the children to survive. That's when Church institutions, because of their protected position, found themselves besieged by frantic people in countries occupied by the Germans during World War II. Jewish parents who saw no chance of saving their children unless they parted with them, handed them over to Catholic convents. This, of course, put the children under canon law. And when these children were baptised, they then faced the same fate as little Edgardo. However, the problem appears to go deeper than canon law, which often provides enough wiggle room to justify many different stances. It seems, instead, to lie in a fundamental matter of priorities. Pius IX, with his characteristic lack of tact, stated it more frankly than his successors are ever likely to do. He argued that between the two competing authorities — that of God and that of the parents — God's must prevali, for was He not the author of the natural rights that parents enjoyed? James Walston, "Holy fathers and suffering sons: The Catholic church, embroiled in a row over a Jewish boy abducted by Pope Pius IX in 1858, has a new critic - the child's great-great-niece", The Guardian, 11 March 2000. "Jews and Catholics: An Exchange", by A.F. Crispin, David Kertzer, reply by Istvan Deak, New York Review of Books, vol. 50, no. 4, 13 March 2003. 1. Pius IX, Allocution Qui pluribus, 22. (See also 5 and 9.) 9 November 1846. https://www.ewtn.com/library/ENCYC/P9QUIPLU.HTM The Pope is referring to the Apostle Paul's Letter to the Romans, 12.1-2. 3. Pius IX, Allocution “Singulari quadam”, 9 December 1854, quoted in Syllabus of Errors, #19. Ibid. 4. Gazzetta del populo, Bologne, 28 November 1859, quoted in David I. Kertzer, The Kidnapping of Edgardo Mortara, 1997, p. 248. 6. Victor Hugo, “Assemblée Législative 1849-1851”, [II, Expédition de Rome], 15 October 1849, Actes et Paroles, vol. I, [Online reader, page 131] http://www.gutenberg.org/etext/8186 Translated by Dr. David Holohan. 7. David I. Kertzer, The Kidnapping of Edgardo Mortara, 1997, p. 89. 20. "Cronaca", Il Cattolico, 1858, p. 18, cited by Kertzer, p. 147.